An interview with Jefferson the fish. With 7th Grade student teacher: Ms.Woodward. The volleyball game was a lot of fun for the students. They had a great time playing basketball and hanging out before the game. 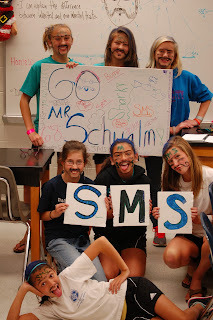 One group of girls had Mr. Schwalm paint mustaches on them. Students made signs to show their spirit, some girls became the cheerleaders for the game, trying to pump up the crowd. The teachers were good players, but so were the ones from Jouett. The whole night was awesome! After the fundraiser was over the donations were counted and... we raised $1,547.50 towards research! Way to go sharks! On Tuesday, November 29 the Sutherland Faculty will be playing volleyball aginst Jack Jouett faculty. It starts at 6:30 and ends at 7:30. UVA sports players will be there to give signatures and pictures. They will have their medals, rings and trophies with them. The students are encouraged to stay after school until the game. All the male teachers will be SHAVING THEIR MUSTACHES INTO WIERD DESIGNS AFTER SCHOOL IN MR.CROWS ROOM AT 4:30. Come students! Tickets are $2.00 at the door for the game. Drinks and food will be available. SMS proceeds go to the Mustache Madness fundraiser. Show your Sutherland school spirit by participating in Spirit Week! Every day this week will be themed differently so you have a variety of ways to show your school spirit. Monday/today was twin/triplet day (pictures below). Tuesday is teal and black day to show support for the volleyball game fundraiser. 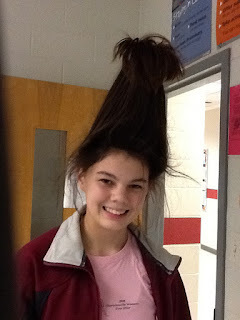 Wednesday is crazy hat/hair day. Thursday is sports day so show support for your favorite sports team or show your love for your favorite sport. Friday is pajama day but try not to fall asleep in class! Here are some of the highlights from the week! Students in Mrs. Smith's and Mrs. Pfaff's classes collaboratively made a Thanksgiving feast today! All of the students contributed to the preparing of the food and all involved LOVED eating it!! The students at Sutherland were out and about today! 6th grade science students in Mr. Collier's class were studying the watershed at Powell Creek...and did a bit of stumbling along the way! 7th graders in Mr. Crow's engineering class were testing out their compressed air rockets! 7th grade students in Mr. Taylor's and Mrs. Shifflett's PE classes were showing off their football skills! Check out the video!!! -A fundraiser started by a UVA lacrosse player. -To raise money to find a cure for cancer. How can we help/ participate? -There will be a Juett Vs. Sutherland faculty volleyball game here at Sutherland: tickets will be 2 dollars and proceeds will go to cancer research. Our goal is to raise $1500 to donate towards cancer research. 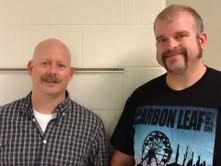 Several of the male faculty have volunteered to grow "unique" mustaches to support the cause. After the fundraiser was over the donations were counted and... we raised $1,547.50 towards research! Way to go sharks! The 11/11/11 seventh grade dance is awesome! The DJ, Cle Logan played amazing music. There was pizza, and a lot of other great snacks and drinks all for a dollar.The funds made will go to seventh grade scholarships and activities. There were a lot of dancers, but other kids played basketball in the gym. It was a ton of fun, and the Sutherland spirit was great. The shark was there too, and today it had a mustache! 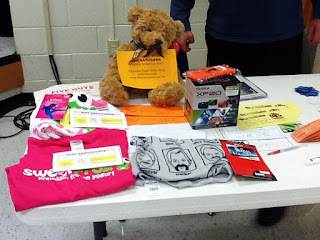 That was because of the cancer fund raiser we are doing. Kids can donate a dollar to cancer research and get a mustache to put up on the wall. The SMS Magazine, ETC (Everything That's Cool) had its first issue released recently. The issues flew off of the homemade magazine rack made by Mr. Gregg. But don't worry, more issues will be released the week after Thanksgiving break. It features sections such as News, Sports, Entertainment, and Video Games/Technology. This consists of a team of highly educated 8th graders, set out to inform the Sutherland Student Body of what is happening in the world, country, and SMS! There is a variety of articles for anyone and everyone, so pick up a copy of ETC today! Ms. Harris' class was reading a novel called "The Devil's Arithmetic." The story was about a girl named Hannah who didn't respect her religion (Jewish). But during the first night of Passover, during Seder Dinner she was transported to a 1942 Polish village, during the Holocaust. She has to find a way to get back home and save her new family from the brutal Nazis. To experience some of the cultural traditions they were reading about, Ms. Harris' class had grape juice (wine), parsley dipped in salt water (bitter herbs), matzot (bread), and a mixture of cinnamon, apples, walnuts, and horse radish (our version of Yemenite Charoset.) The last piece of matzot wrapped in a ceremonial cloth and hidden. The one who finds it gets a prize. This game is called afikomen. The way we played, the one who found the hidden chocolate bar wrapped on a towel got to keep it! Hey students, do you know know what's happening on November eleventh? All I can say is that something BIG is going down on 11/11/11! Dying with curiosity yet? Stay tuned for more info!